The Vikings are close to finalizing an extension with cornerback Xavier Rhodes, Chris Tomasson of the St. Paul Pioneer Press reports. A source informed Tomasson the deal is expected to be in the five-year, $70MM vicinity. That would tie Rhodes to the Vikings through the 2022 season. The cornerback is set to make just more than $8MM on a fifth-year option this season. We heard earlier this week the Vikings made a “nice offer” to the 27-year-old cornerback, who is entering his contract year. Darren Wolfson of 1500 ESPN reported the team is willing to make him one of the league’s highest-paid corners. An assistant coach at Florida State during Rhodes’ time there and a former NFL corner, Terrell Buckley serves as a mentor to Rhodes. He told Tomasson there was a “high probability” Rhodes will sign an extension by the end of the week but is attempting to get a couple of things “squared away” with this Vikes proposal. Buckley added Rhodes “loves” playing for Mike Zimmer and secondary coach Jerry Gray, further pointing to a long Rhodes stay in Minneapolis. At $14MM annually, that would match Rhodes with Richard Sherman and Patrick Peterson as the third-highest-paid corner. Only Josh Norman makes more than that annually, although Trumaine Johnson‘s franchise tag ($16.742MM) has him as the league’s highest-paid corner for 2017. In addition to Rhodes, the Vikings want to lock down key members of their defense, Tomasson reports. 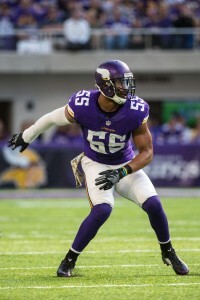 They are internally discussing extensions for Anthony Barr, Eric Kendricks and Linval Joseph, per Tomasson. The team just signed Everson Griffen to a $57.9MM extension. The Vikings rode their defense to a dominant start in 2016, jumping out to a 5-0 mark. Minnesota finished third defensively last season. Barr became extension-eligible after last season, but Kendricks — as a 2015 second-round pick — isn’t yet allowed to sign one until after this season. Joseph has delivered dominant football to the Vikings after they signed him as a UFA from the Giants. He has two years remaining on the five-year, $31.25MM deal he signed in 2014. Joseph is set to make $6.85MM in each of the next two seasons. The Vikings intend to begin the Sam Bradford era on Sunday night, with the team set to displace Shaun Hill in the starting lineup and plug in the trade acquisition against the Packers, Ben Goessling of ESPN.com reports. A league source informed Goessling Bradford took each of the first-team snaps in practice this week. Minnesota traded next year’s first-round pick and another selection that could rise to future second-rounder for the former No. 1 overall pick. The 28-year-old Bradford completed a career-best 65% of his passes for the Eagles in 2015, but when separated from Chip Kelly‘s offense, the ex-Heisman Trophy winner has never exceeded the 61% mark. Hill guided the Vikings to a victory against the Titans but did not produce an offensive touchdown in Minnesota’s 25-16 road win. Bradford’s potential inability to make pre-snap adjustments after such a short time with the team played into Hill receiving the Week 1 nod, Mike Florio of Pro Football Talk notes. Here’s more from the NFC North as Week 2 Sunday nears. The Lions currently have Brandon Pettigrew on their PUP list but could opt to move on from the veteran tight end if they like what they see from current backup Cole Wick, Dave Birkett of the Detroit Free Press writes. Pettigrew tore his left ACL last December and reworked his contract due to his PUP standing earlier this month. He’s under contract through 2017 thanks to the four-year, $16MM deal he signed in 2014. A potential Browns–Jimmy Garoppolo union had big support from inside the franchise’s power structure in 2014 before Jimmy Haslam ordered the staff to select Johnny Manziel, Ben Volin of the Boston Globe reports. Volin, who notes the Browns studied the eventual second-round pick intensely, wonders if the new Browns’ brass would consider a Garoppolo trade after Tom Brady‘s suspension ends. The teams play in Week 5 in Cleveland, although the trade deadline doesn’t fall until November 1. A report earlier this week described third-round rookie Cody Kessler as being a ways away from being ready to contribute. The Bengals’ cornerback corps is flush with high draft picks, and the team added another in 2016 third-rounder KeiVarae Russell off waivers from the Chiefs. The Vikings continue to lock up 2015 draftees today, reaching an agreement with their second-round pick, per Darren Wolfson of KSTP (Twitter link). Wolfson reports that linebacker Eric Kendricks has agreed to terms with Minnesota. Kendricks, a former UCLA Bruin, was selected 45th overall last week by the Vikings. That draft slot means he’ll be in line for a four-year contract of about $5.156MM, with a signing bonus of almost exactly $2MM. Unlike Trae Waynes, who signed his rookie contract with the Vikings earlier today, Kendricks’ deal doesn’t include a fifth-year option, so he’ll be eligible for unrestricted free agency after the 2018 season. Minnesota now has three of its 10 draft picks in the fold, having also agreed to terms with sixth-round offensive lineman Tyrus Thompson today. The Vikings are going down to the wire in announcing their decision on whether or not to pick up the fifth-year options for Harrison Smith and Matt Kalil. GM Rick Spielman will announce those moves Monday, reports ESPN’s Ben Goessling on Twitter. Today was initially the deadline for teams to decide on whether or not to extend their 2012 first-round picks, but since it fell on a Sunday, teams now have until midnight tomorrow to make those calls. Goessling noted he doesn’t expect drama with either decision, with Smith’s fifth year in Minneapolis certainly forthcoming. Kalil’s option, which would cost $11.096MM, won’t be as easy of a decision. A late first-rounder in 2012, Smith’s become one of the league’s better safeties, while Kalil has regressed considerably since a promising rookie campaign, bottoming out last season with a Pro Football Focus ranking (subscription required) of 81st among 84 graded tackles. Minneapolis Star-Tribune reporter Mark Craig expects Kalil’s option to be picked up (Twitter link). Beyond first-round cornerback Trae Waynes, the Vikings expect multiple-position availability from their draft picks, reports Chris Tomasson of the St. Paul Pioneer Press. 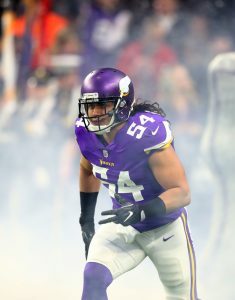 Chief among the potential versatile draftees are second-rounder Eric Kendricks (middle and weakside linebacker), third-rounder Danielle Hunter (multiple defensive line positions) and fourth-rounder T.J. Clemmings (left and right tackle), according to Tomasson. The Vikings not drafting a safety is a vote of confidence for 2014 sixth-rounder Antone Exum, reports Tomasson. Spielman noted to Tomasson he’s “excited about” Exum’s progress despite the second-year safety only playing 16 snaps last season behind Smith and Robert Blanton, who both graded out positively last season on Pro Football Focus’ advanced metrics. Also from Tomasson: the Vikings will slot former Alabama tackle Austin Shepherd at guard, where he played at the Senior Bowl. The 6-foot-5 rookie said half of the teams he spoke to before the draft sought him at tackle, with the other half preferring to see how he can transition to guard. Kendricks will be the Vikings rookie that flashes most this season, writes Matt Vensel of the Star-Tribune. Kendricks’ coverage ability stood out to draft experts, and Vensel notes the ex-UCLA backer has a good chance of starting Week 1 between Chad Greenway and Anthony Barr. Waynes could have to open the season behind either Captain Munnerlyn or Terence Newman. Former Vikings offensive line coach Jim Hueber was surprised Clemmings, who he coached at Pittsburgh, made it to Day 3 without finding an employer, viewing the former college defensive lineman and standout basketball player as a steal, per Sid Hartman of the Minneapolis Star-Tribune. The Titans‘ No. 2 overall pick appears to be the hottest trade chip on the market today, and Jim Wyatt of the Tennessean (Twitter link) hears that the club has spoken to the Rams and the Jets, in addition to the Browns and Eagles. According to ESPN’s Bob Holtzman, the Titans are “open for business” when it comes to trading the second overall pick, but the team is using the Robert Griffin III trade as a point of reference, which would mean getting three first-rounders for the No. 2 pick. Multiple reporters, including Jay Glazer of Fox Sports and Ian Rapoport of NFL.com (Twitter links), are suggesting that the Titans’ asking price is massive. Rapoport points out that Tennessee is seeking such a huge return that it’s making rival teams think the Titans just want to draft Marcus Mariota and be done with it. Tony Pauline of DraftInsider.net (on Twitter) hears from multiple sources that UCLA linebacker Eric Kendricks is in the mix for the Cardinals in round one. The Rams‘ discussions with the Titans haven’t amounted to anything “meaningful” at this point, tweets Jim Thomas of the St. Louis Post-Dispatch. Meanwhile, Albert Breer of the NFL Network (Twitter link) hears that the Rams may be looking at bailing out of the top 10 and picking up more picks. The Jets and Washington have also been cited as potential trade-down candidates in the top 10. Browns coach Mike Pettine told NFL Network’s Andrea Kremer that “opinions on Marcus Mariota in this building are varied,” according to Mary Kay Cabot of The Plain Dealer (via Twitter). Cabot notes (link) that opinions on Johnny Manziel inside the building were varied too, but that didn’t stop the Browns from drafting him in 2014. She also hears that the Browns do not want to surrender their first-rounder in 2016 to land the Oregon quarterback (link). A big problem for the Browns in any potential trade involving Eagles quarterback Sam Bradford is that he may not negotiate a long-term deal anytime soon with the Browns, Jason Cole of Bleacher Report tweets. Bradford may prefer to be dealt to the Titans and, presumably, would be more open to a long-term deal there. In the event that the Browns acquire Sam Bradford or another quarterback, the Cowboys will not be interested in trading for Johnny Manziel to replace Brandon Weeden, Ed Werder of ESPN.com tweets. NFL.com’s Michael Silver says that the Jaguars are a team to keep an eye on as they could move their high second round choice to get back into the back third of the first round. Before answering readers’ questions in his weekly mailbag this week, Peter King of TheMMQB.com passed along a number of the latest draft rumors he’s hearing with the first round just one day away. Let’s dive in and round up the highlights…. The Buccaneers have yet to receive a trade offer that “would come close” to making them decide to move down from No. 1. The Titans, Buccaneers, and Jaguars have all inquired with teams picking late in the first round about moving up from the second round, says King. The three teams have the first, second, and fourth picks, respectively, in round two. One GM told King that while the Titans still look like the favorites to end up with Marcus Mariota, he wouldn’t be shocked if Cleveland “trades the farm” to land the Oregon quarterback. The thinking is that Browns owner Jimmy Haslam is sick of the merry-go-round at the position, and would like to land a “squeaky-clean” signal-caller to lead the franchise. The Cowboys would love to see running back Melvin Gordon fall to them at No. 27, but two other names to watch are linebackers Eric Kendricks (UCLA) and Benardrick McKinney (Mississippi State). The Patriots like USC wide receiver Nelson Agholor, who looks like a logical target for the club if he’s still available at No. 32. With the 21st overall pick, the Bengals are considering Texas A&M tackle Cedric Ogbuehi, who had ACL surgery in January. King views this is a sign that teams are willing to wait on a prospect who wouldn’t be healthy enough to contribute immediately if they think he can be a premier player in the long term.